I am absolutely thrilled today to introduce you to two of my favourite people! Some of you have shared with me the challenge of raising children in an increasingly secular world, and some of you grandparents (yes, you’re a growing demographic amongst my readership!) have told me of your worry and concern about the world your grandchildren are inheriting. Marilyn and Derek are ‘senior’ friends of ours, full of godly wisdom and humility, and it’s my pleasure to welcome them to Desertmum today, to share some of their experience of being parents and grandparents. Please give them a warm welcome! Welcome to Desertmum, Marilyn and Derek! Please can you introduce yourselves? Hi. We are Mazdek, a couple of ancient grandparents who enjoy reading Desertmum’s blogs, as they pose questions and answers about the many parenting issues that arise and challenge us daily. What are some of the joys and challenges you’ve faced as parents and grandparents? Our ‘children’ are in their fifties, which means we are some distance in time from contemporary challenges faced in parenting. But our experiences over the years have prompted us to live happily with the philosophy that ‘once a parent, always a parent’. This is born out of experiences in standing alongside adult children in times of illness, loss, emotional pain, and other times of difficulty. But it is not only sharing the hard times, it is also the blessing of being able to share many good times, such as holidays, birth of grandchildren, the ‘oohs’ and ‘aahs’ of many school events, helping organise birthday parties and other celebrations. The joy of being trusted to provide days of care when both parents are working; yes, that role of loco parentis! So important, but offered in the spirit of consistently maintaining the parent’s own standards and routines. These mixed experiences mean the different roles of parent and grandparent are fulfilled on different days, or even hours of the day, while young children are at a stage of dependency. You must have seen a lot of change in parenting styles through the years. Yes – we’ve experienced many differences of attitudes and values in parenting between generations; from our childhood where Victorian influences were evident, to the ‘Swinging Sixties’ when our children were young, to the present Age of Technology – or is it Brexit?! Having lived through many changes, we understand the dilemmas faced by all parents, of whatever faith, or none, who express concern about values in contemporary society. For those who, like us, are followers of Jesus Christ, many influences appear to increasingly threaten Christian values. This concern is real and children are growing up in a very different world. The world of social media poses challenges that many parents, plus we old grandparents, never faced. We hasten to confess we cannot offer simple answers to these contemporary challenges, so if that’s what you’re seeking, do feel free to stop reading! Do you think concerns about the undermining of Christian values are justified? These concerns are recognised by many, including Scripture Union with 150 years’ experience providing services and teaching materials for children and adults. Their surveys reveal 95% of children have no connection with church or the Christian faith. They, like other groups, are not simply observing these changes, but developing new projects, so that the 95% will have opportunities to hear of God’s love for them. Of course, the challenge for parents/grandparents who long to see their children come to personal faith is how to encourage their offspring to see that fullness of life comes through Jesus Christ rather than social media. This appears to offer more exciting experiences than a faith in God which is frequently termed ‘out of date’. We share the frustrations the challenges pose: feelings of failure when there is no interest in attempts to share the good news; an apparent lack of answer to prayers; the feedback that assemblies and RE are ‘boring’, etc etc. So is there anything that parents and grandparents can do to encourage them towards a life of faith? Our experiences will probably sound familiar to many but we share them, not as showing the route to success (if only!) but as things we hope may be helpful and encouraging. Consistency in living as believers is essential; regular prayer and Bible reading, attendance at worship, involvement in serving others and using any gifts of ministry. These will be evidence of personal faith, not to be displayed as vanity, simply lived naturally and observed as important by children living alongside us. Involving children in the life of Christian community at an early age is of value; we found an encouragement for our children was to invite neighbours’ children with whom our own were friendly; yes, Sunday was a journey to church with the car full. At later stages, involvement with youth activities, camps and Christian holidays were valued. For our son these included membership of a church table tennis team (yes, more taxi service for away matches) and SU holidays. These holidays formed friendships with young Christians from other parts of the country who came to spend weekends with us, to be part of a holiday reunion. This led to our son’s involvement with another local church, whose Vicar was leader of the holiday events. How did you feel about him attending a different church? We accepted this teenage decision as it meant involvement in a lively youth group and natural involvement in worship alongside Christian friends. Meanwhile our daughter became involved with friends who formed a small team of young people going to local churches to help lead services and share their own testimonies. We encouraged these choices, especially as our involvement in children’s/youth work at our church meant that, at different churches, our own children were learning from other believers, rather than always listening to us! And is it really that easy?! Do our experiences encouraging a journey towards faith sound unreal and too easy compared to your experiences? The present reality is that one of our children is a still an active believer, the other is not. However, the one who is not active has told their offspring to ask Grandad if they have questions about the Bible or Jesus. One, faced with a task set for homework by the RE teacher, wanted to know why Grandad is a Christian. So opportunities to share faith arise quite unexpectedly at times, even if it is only to help out with homework! I know you’re both great pray-ers (although you’ll hate me for writing this!). Can you share a little about the importance of prayer in the lives of our children and grandchildren? Prayer has underlied everything we’ve ever done for our children, or still do today. Our own stories speak powerfully about the importance of prayer: one of us was prayed for, for over 14 years, by a former Sunday School teacher, before coming to personal faith. So we are committed to praying daily for our adult children, as well as our grandchildren. God’s grace and the power of his Holy Spirit know no bounds, and as Scripture reminds us, nothing is impossible with God. Persist in prayer. 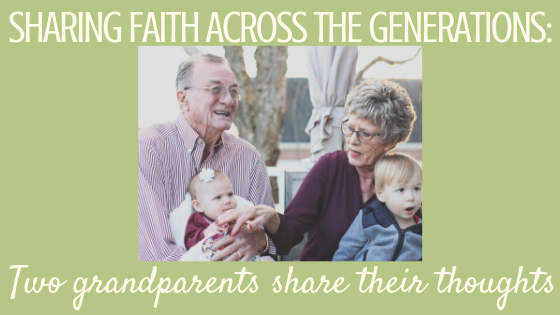 Is it possible for Christian grandparents to introduce prayer into the lives of their grandchildren? Do you have any tips? Take opportunities to pray with grandchildren; these can arise when they are unwell or unhappy. Telling them about times you have experienced God healing others, or answering prayer, is a way of making known that God is alive and active, and that God is for us. One grandson was off school, unwell with a temperature, and we were called to be with him while parents were working. We prayed for him that morning. In the evening his brother was playing in a cricket match we went to watch. There was the other looking well, no temperature, and with energy to run around with friends while watching the game. Surprise, co-incidence, or God at work? What about times when your prayers, and other efforts to introduce your grandchildren to God, all feel in vain? It is important not to underestimate children’s observations about lifestyle. A consistency of behaviour had been noted and seemed to quietly have made an impact. This has been so helpful, with much to mull over! Thank you so much. Do you have any final summing-up thoughts? The influences of the world that our children/grandchildren are growing up in are significant. Many of the negative influences can impact on our offspring to draw them away from faith in Jesus Christ. Our ability to change the world and cultural influences is limited. Don’t be discouraged, live consistent Christian lives, be persistent in prayer, encourage involvement with an active Christian community, where children and teenagers are welcomed, valued and can share fun and faith; welcome their questions and challenges, talk naturally about what God has done in your life, and is doing in today’s world. Remember, nothing is impossible with God; he is in the business of transforming lives. The student charity Fusion had several hundred non-Christian students respond to the invitation to ‘Try Church’, when greeted at Freshers’ weeks. In the past few months we have been aware of local churches welcoming students who turned up for the first time in their lives, and have found faith. Hey, some parents/grandparents are probably rejoicing over that; indeed, some parents coming to watch their teenage daughter’s baptism also affirmed their own baptismal vows! God is very active in our day. Like many others we shed tears as we pray for family members who have yet to discover the fullness of life Jesus offers. We join you in continuing to trust Him; He is able to do more than we ask or imagine. Live as Christ’s ambassador, and keep loving and praying. Words can’t express how much I love hearing from these prayerful servants. What has particularly struck you from their words? What ‘takeaway’ thought will stay with you this week? Let’s chat in the comments!